This week, President Obama will cap off the White House forum on jobs and the economy with a trip to Allentown, Pennsylvania. There he will focus attention on the challenges workers are facing during these tough economic times. Alas, the President will be misinterpreting the miseries on display in Allentown. The real lesson should be that bad tax policy can cripple a state’s economy, and no amount of federal stimulus money can undo the damage. Pennsylvania’s job losses did not start with the most recent recession. Indeed, the out-migration of taxpayers began more than 15 years ago in large measure because Pennsylvania’s tax system is unremittingly hostile to business. Tax Burden: Taxes consume 11.2 percent of the state’s income, which gives Pennsylvania the 11th highest state and local tax burden in the nation. Business Tax Climate: Pennsylvania ranks 27th on the Tax Foundation’s 2010 State Business Tax Climate Index which measures the business-friendliness of each state’s tax system. Of the five major components of this index, Pennsylvania’s corporate system ranks 37th and its property/wealth tax system ranks 42nd. The only bright spot in the state’s tax climate is its individual income tax system which ranks 13th overall. Corporate Tax Rates: Pennsylvania’s 9.99 percent corporate tax rate is the second-highest statutory rate among the 50 states; only Iowa’s 12 percent rate is higher. However, when federal deductibility is accounted for, Pennsylvania’s rate is the highest in the nation. If Pennsylvania were a nation, it would have the highest overall corporate tax rate in the world at 41.5 percent (federal plus state, accounting for the state-local deduction). 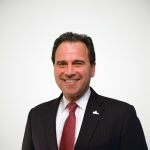 Capital Taxes on Businesses: In addition to paying the highest corporate tax rate in the nation, Pennsylvania businesses also pay one of the highest capital stock taxes in the nation at 0.290 percent. Pennsylvania is also among only 10 states to impose an intangible property tax on businesses. Estate Taxes: Pennsylvania is one of 16 states to have decoupled from the phase-out of the federal estate tax, which means it still imposes its own estate tax. It is also one of only four states to have both an estate tax and an inheritance tax. It is not surprising, therefore, that Pennsylvania has been losing businesses and people to more tax-friendly states. As Tax Foundation analysis of IRS migration data indicates, this out-migration is not only impacting Pennsylvania’s population, it is also impacting the state’s tax base. 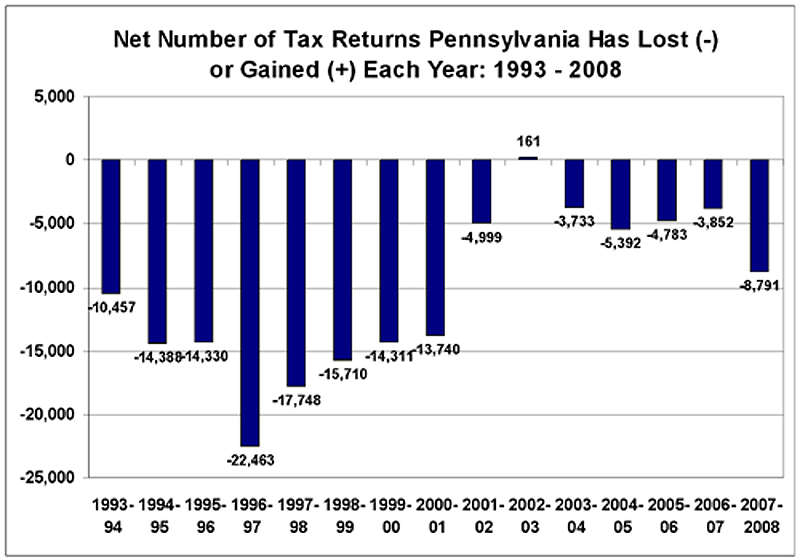 Chart 1 shows the net number of tax returns Pennsylvania lost or gained between 1993 and 2008. In every year but one, 2002 to 2003, the state saw more taxpayers leave the state than move into it. Clearly, the largest losses occurred between 1993 and 2000, an average of more than 15,000 per year. Since then, the state has been losing an average of nearly 3,800 taxpayers per year on net. But as Chart 2 shows, the loss of taxpayers also means that the state is losing their incomes to other states which, in turn, means that the state’s economy and tax base are shrinking. 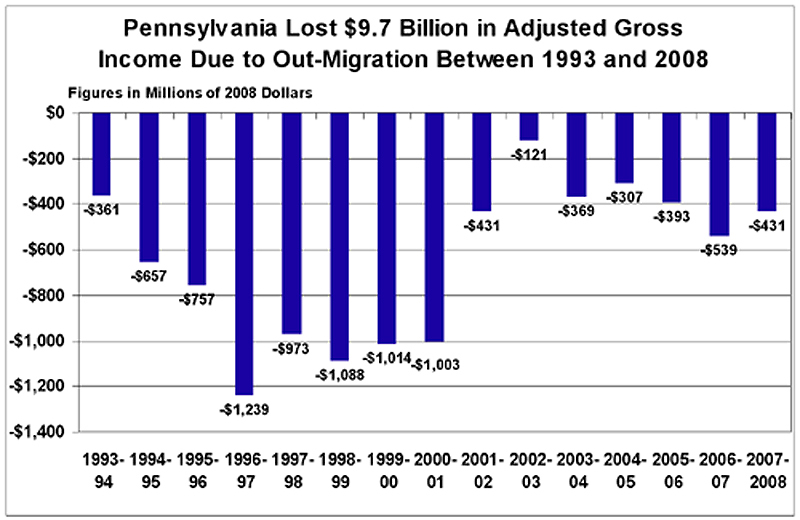 Between 1993 and 2008, Pennsylvania lost on-net $9.7 billion in adjusted gross income to outmigration. Even in the 2002-2003 period, where the state gained slightly more taxpayers than it lost, it still lost AGI overall because the people who left the state earned more than the new people who entered the state. Recent Census data gives us an insight into who is moving into Pennsylvania compared to who is moving out. First, it is interesting to note that in contrast to the IRS data that shows a net outflow of tax returns, the Census data for 2007 to 2008 shows a net inflow of roughly 9,500 new people moving into the state. One reason IRS and Census data frequently don’t match is that a single tax return may represent one person, a married couple, or an entire family. So it is possible that the tax returns moving into the state have more dependents than the tax returns moving out of the state. Another reason IRS and Census data don’t match is that Census data accounts for people who don’t file a tax return, including college-aged students and retirees. The migration figures by age show that Pennsylvania is gaining young people (under age 19) and young families (ages 25 to 44) and retirees over age 65. But the state is losing college graduates (ages 20 to 24) and people in their peak earnings years (ages 45 to 64). But the real warning signs for the state are seen in the education and income figures. Pennsylvania is gaining people who have little or no income and less than a college degree (college students mainly) but losing people at all other income levels and those who have a college degree or better. There are many reasons behind the migration of Americans between states, and taxes are just one. But taxes can clearly create a hostile environment for business investment and job creation and Pennsylvania appears to be a prime example of that. It would be easy to blame “the weak economy” for the hard times that have befallen the people of Allentown and the state of Pennsylvania. But the migration of taxpayers and their incomes out of the state has been going on for more than 15 years and the one constant has been the state’s tax system. These trends will likely continue long after the national economy recovers unless state lawmakers overhaul their business tax system.